The "Row to the Pole" publicity stunt looks doomed to failure by a sea ice block | Watts Up With That? Regular readers may recall that back on June 15th, I pointed out the absurdity of this “Row to the Pole” publicity stunt sponsored by the whisky company “Old Pulteney” which had plans to row to the North Magnetic Pole (based on the 1996 location) and along the way take some temperature, water, and ice samples along the way in the guise of a science expedition. Undeterred by this complication, the group of rowers has set off anyway, and made some good progress according to their Facebook page, covering 40 kilometers on the first day. They even offer a satellite tracking page to watch the progress. Note the patch of white in the red box that the planned rowing path transects. Are those clouds or ice? The magnified view area gives the answer below. Yup, unless those guys in the rowboat have an icebreaker leading the way, or there’s an “instamelt” de-icing ahead of them, they likely aren’t going anywhere near the old North Magnetic Pole circa 1996, much less the actual one. Looks like “Scotch on the Rocks” for them. However, like any good publicity stunt, they’ll probably figure out some way to make a success out of it, perhaps declaring that “important though incomplete science has been done”. How can the North Pole be NNW of anything? It is N of everything! Back up a day or two to let the clouds move out of the way, as needed. Yes, they are in for a very rude awakening. The danger, as I see it, is paddling straight into moving ice packs. One of these publicity stunts is going to result in casualties, GPS or not. They’ve been sampling too much of their sponsors’ wares. Andrew, Scotch whisky doesn’t have an ‘e’. Sorry Anthony, not ‘Andrew’. Doh. Let the Annual British Arctic Follies begin. I’ve been following the postings on their web site. They seem a bunch of pretty good ole boys in a British sort of way. They don’t take themselves too seriously. The whiskey ain’t bad either. I love scotch. I’ll do anything for a pure malt. Such a tragedy. My heart bleeds. I shed one tear. They’ll be leaving soon and haven’t fed even one starving polar bear yet! Why, I’ll bet they haven’t even rescued a single drowning polar bear by pulling it into their boat! They’ll have plenty of time on their hands to accurately measure the melting point of sea ice. I wonder what their boat is named? Titanic II might be appropriate. Ice with your single malt, anyone? No doubt they prepared in advance by bringing a dog sled and some mutts in the boat. I mean, they’re not idiots, right? Right? BTW, for those who deplore satirical, mocking, or derogatory articles and comments on this, a “puzzling things” blog, rest assured that my previous comment about dog sleds was totally serial. Hope their photoshop skills are better than their satellite imagery reading skills. That will be the only way they successfully navigate all that “melted” ice. I hope they have some kind of escape/rescue plan, otherwise lives may be in danger. This has become a traditon. Row into arctic to demonstrate the impending danger of melting polar caps. Get stuck in ice and call for rescue. Get rescued by evil fossil fuel guzzling monsters. Come back to heroes welcome. Maybe next summer someone will smear themselves with seal fat and walk slowly around Churchill to demonstrate how few polar bears there are left in the world..
A graph of the speed of magnetic pole drift, with speed on the Y-axis and time on the X-axis is a is identical to Mann’s hockey stick. Wonder if they have seen any dead polar bears floating in the water. According to Gore they should be everywhere to be seen. The last Facebook update says there is a problem with their website today. There is, but only the title page, which is now completely blank; if you link to specific parts of the site, like the one in this post to the satellite tracking page work just fine. Hmmm. You mean like sticking close to land, where they can quickly get out of the way of marauding pack ice? 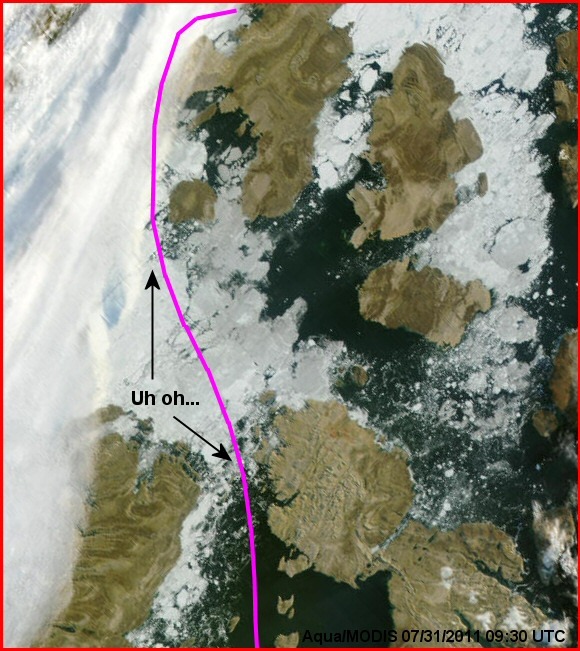 I doubt it, being that paddling upstream to the flow of Sea Ice debris isn’t the smartest thing to be doing. Anthony, I hate to tell you but you have made an error. Steven Goddard just posted a 1973 prediction of an ice free arctic region by 2000. So obviously there is no ice there as this is 2011 already. They had models to predict with and all you have is satellite imagery. What are you going to believe, your eyes or scientific models? A rowboat in the Arctic? What could possibly go wrong? What the hey!? No phony biotelemetry data? I know where they can get some, cheap. There’s a photo here: http://www.anenglishmanscastle.com/ that shows the intrepid explorers fitted out in spiffy harness for portage across that ice. But I’m of a skeptical bent and wonder whether the whole thing is just a whisky fueled prank, despite the photo. I’m amazed that no one else has thought of this. (They probably will while I write this comment.) The expedition may, even as we wring our hands in concern over their fate, be sitting in a snug in Aberdeen, sampling the Auld Pulteney, and laughing at all the loons who fell for the joke. 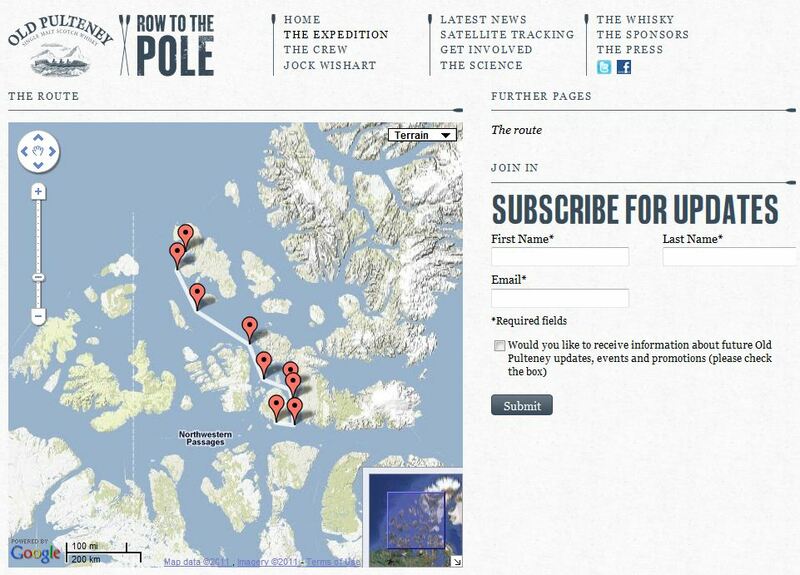 Note that the Row-to-the-pole website link on the sponsor’s site goes to an empty page. Here’s to ye! Hope they have all the necessary survival equipment. The Canadians and Alaskans on here might correct me but according to a good friend of mine who was just recently given the honor of placing Australia’s most precious collection of seeds into the Millennium Vault in Norway’s Svalbard Island, standard equipment required by an individual or by any group when going anywhere at all in those latitudes were a pistol and a rifle. When the now common polar bears appeared they got some pistol shots to frighten them off. If the pistol didn’t do the job and the polar bear kept coming then the rifle was used and if necessary, with deadly intent. Anthony, would it be possible to overlay the route of the Top Gear trip to the magnetic pole for comparison? According to their website, they have an ice expert in their support group. Wonder what he has told them? Why on earth (excuse the expression) did they not choose the geographic North Pole — which does not wander around like the magnetic North Pole and is far more meaningful? And, given that they did choose the location of the magnetic North Pole, why choose one that is out of date? Presumably because it just so happens that the out of date magnetic pole stood the best chance of being reachable by rowing. Talk about a pure gimmick — to prove what?? They sure deserve their comeuppance. Their press release says their boat is designed to be dragged over the ice, so not only are they not going to the pole, but they’re not expecting to row there! They are probably prepared for a tropical storm so not to worry. True, hardly anything is known about where these researchers have been, what they’ve done, what ailments they may have, what medications they take (legal and otherwise)… It would be horrific if an innocent polar bear was harmed by ingesting an inconsiderate meal that didn’t make sure it was edible! Still poles apart on global warming, it seems. What could go wrong, he says. I’ll tell ya what could go wrong. Everything. That’s what could go wrong. Interesting to see that, all the sarcastic Sceptics believe that: the more ice on arctic means colder. The truth is completly oposite. Colder = less ice – warmer = more raw material for replanishing ice. Get all the corect informations on http://www.stefanmitich.com.au so we can see the end of the Warmist propaganda. Come, come now. 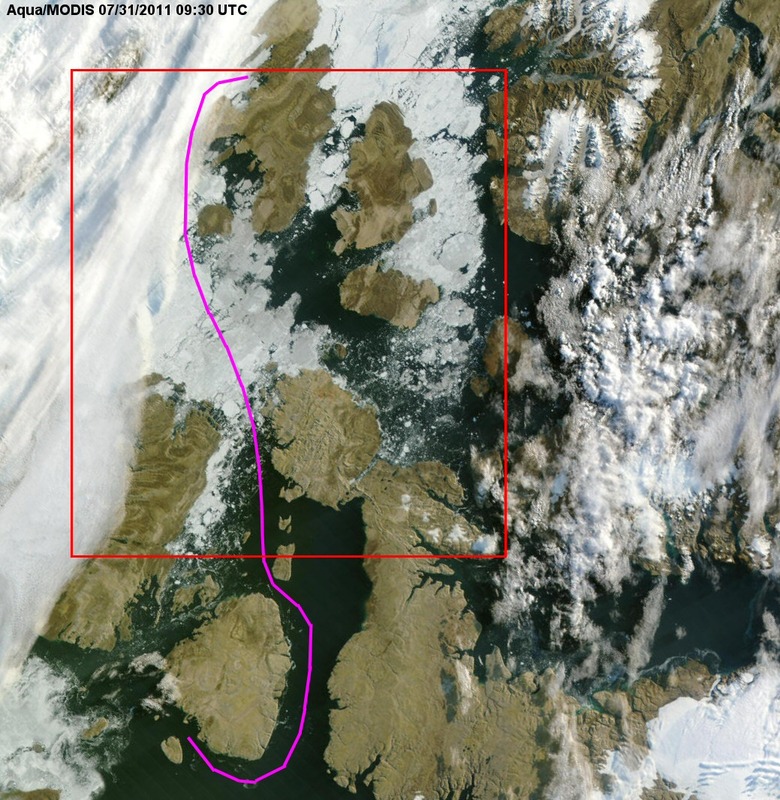 We know you are exaggerating – not “all” of the ice up north has melted. Yet. A little but remains, but it is safely too far away from the north coasts up there to worry about -> and “everybody” knows that the polar bears are so rare and almost extinct (they’ve been declared endangered by Washington experts (who know everything of course) that they’ve all drowned swimming up there. So: The polar bear threat is gone. Washington says so. There will be no ice to get in their way. But…. About this “speed” thing. They’re promising 80 miles a day: Pulling a boat where they have to, rowing when they are not walking. (Resting, eating, prepping food, how many hours a day????) The “ancient” walkers (who were in much better shape than these guys) going cross country across the flat prairie walking next to their wagons only averaged 15 miles per day on the flat parts of the Oregon and California and Santa Fe trails. And they were not “pulling” a “sledded” boat. Their oxen did that part of the work. I give them odds on really making 15 miles per day (when they’re moving at all), and quitting by Sept 25 with (another) plane flight rescuing them. Now, I’m not one to minimize the importance of travel insurance but when you’re out in the freezing and sometimes stormy Arctic ocean in a little row boat making your way between ice packs and hungry hordes of Polar Bears, what could possibly go wrong? And personalized stainless steel dog tags? I’m not going to go there. “Mr. Wishart and his crew’s attempt to row to the magnetic North Pole has only recently become a possibility due to the dramatic climatic changes taking place in the region which have decreased the size of the ice sheets and left large areas of the ocean unfrozen. If they have to portage over the ice, doesn’t that sort of defeat the message? And would it not be obvious to check the ice conditions before leaving? Or is it supposed to melt in the next few days? Too bad the entire cabal of Warmistas doesn’t take to kayaks on such a journey, but with no radios or anything else manufactured with eeville carbon-impact manufacturing, only prehistoric implements they make themselves. As mentioned above, no calling upon petroleum-fueled boats for rescue, though we’ll allow them to beg the dophins for assistance. I’ll donate the ultrasonic whistle and an English-Dolphinese dictionary. And take all the rest of the Gaia-worshippers with you. The polar bears will welcome you with open jaws. Absolutely hilarious. No such thing as bad publicity. I like the fact that their website image shows blue open water. In Norway “snowmobilesandwich” is a slice of bread mixed with a bottle of moonshine in a blender. Does not freeze so easily. Well, it looks as if “Old Pulteney” and I are going to part company. Billy Connolly was right – ” F*&#*^g Wick”. I tried Scotch once, it tasted like tape. Of course they will succeed, they are carrying a newspaper clipping from 10 years ago that says all the ice would be gone within 10 years. I think they are planning to simply waive that clipping around in front of them as they journy (that’s Scottish for journey) forth. Piece of cake. Seriously! Wonder if they know that Shackleton’s crew was only able to pull boats about 1mi/day over pack ice. Yo ho ho and a bottle of Tums. Isn’t this stunt the perfect metaphor for Warmista climate science? Follow the science and it will lead you to disaster unless…unless…modern technology comes along to save you from the elements. And the argonauts? Fools on a fools journey. Yes, it reads like a play with “midsummer” in the title. Hansen, Schmidt, Trenberth, all of The Team, and others are rowing powerfully but drunkenly toward a disaster that all of their science could not forsee. When has reality ever stood in their way? I’m looking forward to how this will turn out. Of course, I am worried for their safety and wish them well. Still, I would like to see their expressions when reality will not compromise. Also, I don’t care if portage betrays the point of global warming. I’ve portaged. I would not wish that on my worst enemy. They have a return trip as well. If they keep going, this will turn out real ugly I’m afraid. I think they actually left a couple of days ahead of schedule, perhaps due to pack ice drifting north toward their start point … I wish them a safe return and I hope they don’t have to resort to cannibalism. The infrared selection on the Arctic for the link you gave me says this stunt (ahem…expedition) is ill-fated. T minus 4 hours 48 minutes to STEREO BEHIND roll to Elenin. Weather conditions being a sea of ice. I believe their destination island is called Ellef Ringnes Island. The worse thing about this whole trip is that they have a BBC Cameraman on this trip…..
Why didn’t they just drive there – like the Top Gear crew? Which, as we all know, is caused by [drum roll] Global Warming. 3M is the best, much less bitter than that cheap Chinese import. A good cellophane after dinner goes well with stamps. A good weekend tape is duct, and pretty much any maker can get that right… well, usually. For this category I recommend Gorilla™ since it has the staying power of the old school duct tapes. At least they’ll have plenty of ice for the whisky!! Getting blind drunk they’ll be doing us all a favour. I suggest that anyone wanting to save the world via single malt consumption does it with Laphroaig. You get a free square foot of the precious peat to save it from development. The rent of a dram must be collected in person (best to avoid the midge season). With planing and navigational knowledge such as theirs they should take care they don’t fall off the edge of the world! Or maybe they have their very own bridge over troubled water? I hope someone has thrown a few dead polar bears in front of the rowers just to fulfill their “spiritual” journey. The amount of people that get free vacations by pretending to be saving the planet is incredible. Just a false pretense in global warming will just about get you anything you want nowadays for free. Yet it is the taxpayer or the owner of a commerical ship that will pick up the bill when these numpties send out an SOS. So if they have to be rescued off the ice, can we send the bill for that to all the leading AGW theorists? After all, they should bear the responsibility for making these people believe that the Arctic would be ice free enough to row to the North Pole or whatever they believe to be the North Pole is. The BBC program Top Gear drove there, well Clarkson et al did, plus a film crew and the program did show the GPS position at end of trip at the NMP. Whisky and the sea is a good combination. When sailing on the North Sea (in me younger days) the ‘tot for the crew’ at 11 and at 4 were a potent preventor of seasickness. And very enjoyable too. Whisky and ice, however, is near to sacrilege. I never met a Scotsman who took his dram other than straight or with a little bit of water in it, to bring out the flavour of in particular the peaty malts of the Western (Scottish) isles. So, I wonder how the association of Old Pulteney with this expedition will go down in Scotland. Old Pulteney? The only whisky I could never tolerate. Old Pukeney more like. Yuk. Why doesn’t WUWT go into competition and organise a row to the South Magnetic Pole? The chances of success are about the same and if you can get sponsorship from Cambletown or Lagavulin I’ll certainly be the first to volunteer. I’ll even supply the ice ‘cos there aint none down there anymore. If they do claim they made it to the pole but they actaully didn’t then acomplaint to the advertising authority will be on it’s way as a commercial organisation will be getting publicity out of a false claim. “It’s no wonder that truth is stranger than fiction. Fiction has to make sense”. Mark Twain. It’s cousin, snow, has now become so rare in Europe and the US that our children don’t know what snow is. So we are taking up sand boarding in Anractica, as advised by the lord of great knowledge, aka Al Gone. Well, I for one wish them good luck. GW activists have been known to have trouble dealing with polar reality. True, however one could wind up with tape worm. Totally Serial??? Maybe Captain Crunch will show up and give them a lift!!! The picture of these geeks harnessed up to their boat on what looks like a perfectly flat frozen lake and pretending to be pulling is priceless. Check out the pics from the Shackelton expedition. Pack ice is more like pulling the boat through the debris of the World Trade Center. And Shackelton had dogs for most of the time. Not to mention that the ice is constantly shifting, cracking and splitting. Good luck boys. The funniest factoid I read about this is that the bottom of the boat is painted yellow so in case it capsizes they will be able to find it again. I hope the videographer keeps his camera dry and gets that shot! Why don’t they just drive to the geographical north pole in a Hägglund BV-206? Aka the Ferrari of the Antarctica. The British army have lots of them. This expedition is typical of the younger crowd’s indoctrination to the new wave principles of the power of positive thinking. They understand this principle as – ignore reality and think beautiful thoughts about ice and it will respond by parting like the red sea. It is somewhat akin to the idea of controlling climate via CO2 manipulation. I think a comparative skeptical expedition would be a voyage to the Maldives to prove it hasn’t sunk below the waves. Who do you suppose, will experience, the more enjoyable exercise? Just to ensure the expedition is regarded as “scientific”, the Maldives coastline, could be accurately mapped, and the square meter area of the island calculated and compared to the value 30yrs ago. scotch..on the rocks, sometime soon. hope they got the Eperb ready, idiots. they go to all that effort to get the water out while distilling, why add it back? They’re succeeding in their Marketing Efforts! After reading this article, I’ll have to try it. It’s all about Name Recognition. Rowing up to the ice wall will provide great pics and videos. This is nothin’. When I was a kid, we had to walk 81 miles to school through snowdrifts taller than we were, uphill both ways, and all we had to drink was Glenfiddich. These kids don’t know how easy they got it !! Do you have any idea how many people have tried similar stunts over the last several years? Most of the time the Canadian Coast Guard has to airlift them out before they die. Sheesh. Hah! David Ball! 81 miles to school. You were lucky. Me Dah had a paper shop. When I got home from school it’d blown away!!! Now how can a dummy like me get my head around this science stuff with this type of confusion? Am I missing something here or are they talking about two different things? Could some kind person please have a look and enlighten me or should I just have another drink of Old Pulteney? Who needs an ice breaker? Not even in their wildest dreams. Hmm. This is interesting. I saw on their Facebook page that someone commented about ice and they seem confident it will be melted by the time they get there. This will be more interesting to follow than the standard sea ice extant so thanks for posting! They seem to be happy enough at the moment – they have made good progress across the ice-free Wellingtron Channel. But I expect they’ll be having Close Encounters of the Reality Kind real soon! “The last four summers” doesn’t include this one, so it’s 2007, 2008, 2009, 2010. http://www.arctic.noaa.gov/reportcard/ArticReportCard_full_report.pdf doesn’t seem to exist. 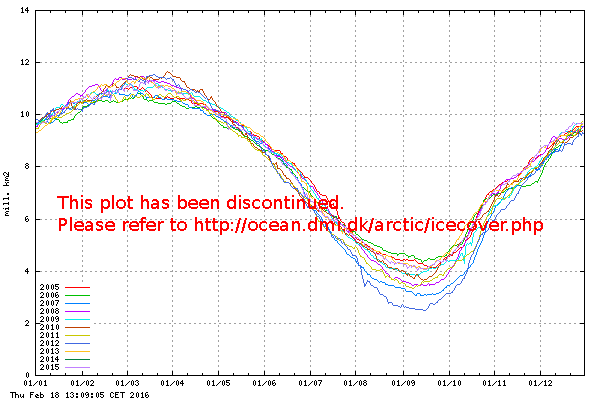 Look at http://ocean.dmi.dk/arctic/icecover_30y.uk.php . Note the last four years. Note they are the lowest minima of the record. You appear to have read the description as “four lowest minimum ice extents” as sequential, i.e. each newer year breaking a record set by the previous year. I wonder if the Canadian Coast Guard keeps records of the people they have had to assist and rescue. I imagine there’s been an uptick in the past decade. It might be fun writing an article describing the troubles people have gotten themselves into. A good use for whisky is to lubricate the tongues of men who are, or have been, in the Coast Guard. They’ve got some pretty funny tales about naive people who imagine the sea is always flat, and sailing is always smooth. I wish I could be rescued, for it would mean I could afford a boat. People are fully capable of getting themselves into trouble at sea, without throwing grinding ice into the mix. I think a comparative skeptical expedition would be a voyage to the Maldives to prove it hasn’t sunk below the waves. The Hong Kong tidal gauge the IPCC relies on. The tide-mark in the wall in Tasmania that Daly discussed. Wave-erosion marks in cliffs in the Mediterranean. The North Carolina location relied on by Mann et al. Etc. An hour-long TV show could be spun around this, with lots of interesting visual images. The acceleration of the MNP obviously caused EM disruption of the neural circuitry of certain susceptible individuals, leading to the generation and publication of the Hokey Stick. Easy, see? You just have to posit the correct high sensitivity levels! Windy conditions today and some much heavier cloud cover made for a pretty tough day. There was a magical start to our day seeing no few than 4 polar bears. They were our first…and seeing a mother with cubs was really special. They are quite magnificent creatures and a real privilege to see them. Not that everyone immediately realized what they were looking at. Now I don’t want to point fingers, but one of my colleagues actually thought the cubs were…. Goats! I’ve got a spare aerosol of windscreen de-icer in my garage that they might find comes in handy…. However it seems these reports are intentionally confusing to a layman,on the Expedition science page it says things like the four lowest since records began,but on the graph, 2007 was lower.It seems like this climate science is all smoke and mirrors. Anyhow thanks for the reply, it’s still as clear as mud to me. Just a footnote,that link I wrote to the report I read should be (http://www.arctic.noaa.gov/reportcard/) and down the bottom of the page is a PDF link. (www.arctic.noaa.gov/reportcard/ArticReportCard_full_report.pdf) So I had a look at this report “The last four summers” doesn’t include this one, so it’s 2007, 2008, 2009, 2010. http://www.arctic.noaa.gov/reportcard/ArticReportCard_full_report.pdf doesn’t seem to exist. It does if Arctic is spelled correctly! Partaking of the “Old Pulteney” a little too soon, eh? After we’d said our goodbyes to the support crew we relocated to the other side of the Bay for extra protection. As they had the evening before, Dave and Mark B decided to go head to head with nature and camp on shore. This being a team expedition we all pitched in to help them build a site and set up camp, then went our separate ways to dine – myself and Mark D confined to the servant quarters out the back of the boat, Jock and Rob in the penthouse up front and Dave and Mark in the adventurer’s cave up on the hill overlooking the boat. Whilst everyone else was lost to the fairies I was tapping away on the computer and as I gazed out the cabin in search of some inspiration I spotted a large white furry animal fast approaching the tent. Yes, it was a polar bear. We’d been trained by Tony Woodford in the art of polar bear evasion and ultimately warfare, so I was geared up to handle the situation. Instinct and experience kicked into overdrive as I burst out the cabin beating my chest and yelling at the top of my voice, “Whoa bear, whoa bear”…hardly vocabulary or tone to scare a small child let alone one of the most fearsome creatures on the planet. This could explain his rather dismissive look in my direction – in fact far from scaring him off he actually made an approach to the boat. Thankfully Rob was on hand and after letting out a couple of bear flares the bear decided enough was enough – either the smell that had attracted him had proved a miserable let down or the fare on offer just wasn’t worth the bother. Either way he made tracks up the hill and away from an ashen looking Dave and Mark. They will no doubt tell you how they were stripped and ready for combat! As the bear left he turned and gave us one final burning glare, a gentle reminder (as if we needed it) that this was in fact his domain and we were little more than visitors. 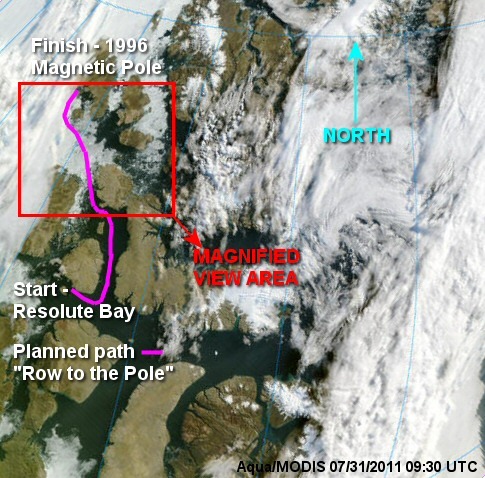 The magnetic North pole is soooo ho-hum. How about the REAL north pole? Daly was the first to publicly raise concerns about the AGW scam. I salute him. Perhaps we can create a DALY prize for those who fight for scientific integrity, applicable to any scientific field. It must not be issued every year, but only in exceptional cases; and the reasons for issuance must be clearly stated. Rather like the opposite of the Ignoble Prize. growler: n., A small iceberg or ice floe just large enough to be hazardous for shipping. “Hi Tom – please check the website ‘route’ section and you’ll see our proposed expedition path. In short we’re trying to get to the Mag N.Pole as certified in 1996 by our leader Jock Wishart…and in so doing create a piece of maritime history. Their excuse is that they are going to where the MNP was certified in 1996. Yet they name their adventure “Rowing to the Pole”. A blatant lie. Interesting “rowing” in that video. A 200 Hp. Merc? Nay sayers, armchair critics, moaners of the modern day! The expedition was conceived before a sponsor was found – not a publicity stunt. The last time the NMP was certified correctly was in 96. Current position is an estimation – either way – does it really matter? The boat is designed to be pulled over ice. Why the negativity? These guys seem to have prepared and trained for years and it looks like a great adventure! A whole web page devoted to criticising something that does no harm at all! I admire their endeavour and commitment, and quite frankly find this criticism remarkable! Hope you all don’t criticise the free will and ambition of the younger generations you know! Fattyboomboom . I don’t think anyone is denying these lads an adventure, it is what most young males need to do and good luck to them. I wish I could be there too. But disguising this jolly as science is what most object to. They are trying to row to a spot on the Earth which is clearly not the top of the world and a place that the British Navy were sailing around in the 1850s during the Arctic summer. They are not even straying into the Arctic Ocean proper. Let’s hope the BBC does not fall for this scam. NOTE: They have made it! 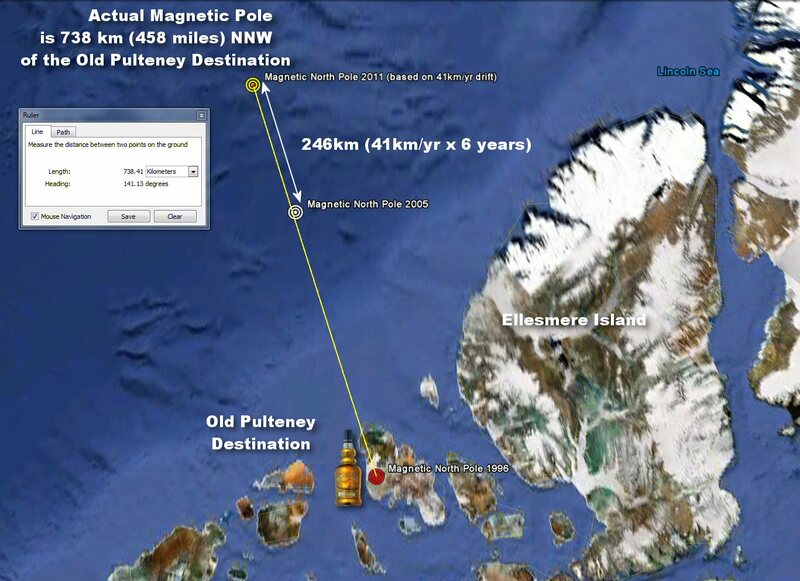 However the resulting BBC media report failed to mention that the magnetic pole is not the same as the geographic pole or that the point they rowed to was the 1996 magnetic pole hundreds of miles away from todays pole. Amazing these lads actually made it and only had to haul the boat over the last two miles of ice. Not bad out of a total distance of 450 miles. Clearly good preparation an excellent crew and a bit of British drive go a long way. An incredable achievement and it is great to see it has stimulated some interesting discussions on this website (plus a massive response in the wider press) on climate change and the ice situation in the area. A great bit of publicity for further investigations into our planet’s climate (changing or otherwise). It is a shame however to see so many negative comments mainly restricted to this website. Good on the lads for achieving something incredable, I feel utterly humbled sat in my warm home on my computer. I hope more people are inspired to go out and see the wider world for what it is as a result of this expedition.